Autumn 1: Let your spirit fly and Three little birds- singing unit. Autumn 2: Year 3 production. Spring 2: Stone Age, The mystic moments - making own music singing and instruments. Summer 1: Making own recycled instruments. Spring 2: IPAD - music Apps. Autumn 1: Mama Mia - singing unit. Autumn 2: Leon on me - singing and instruments. Spring 2: IPAD- music Apps. Summer 1 & 2: Listen to me - learning a range of instruments. Don't stop believing - singing unit. Other half term is swimming. Spring 1: Ten piece BBC Proms unit. Spring 2: Orchestra unwrapped-children will be going to The Anvil to sing a song with different choirs. Summer 1: Stop - rapping unit. Spring 2: Classroom jazz - unit on glockenspiels and keyboards. Autumn 1: Living on a prayer - singing. Autumn 2: Ten pieces - BBC Proms. Spring 1: Classroom jazz - musical instruments. Spring 2: Fresh prince of Bel Air - rap unit. Summer 1: Mayan Gods - making their own music. Spring 2: Year 6 production. · Perform, listen to, review and evaluate music across a range of historical periods, genres, styles and traditions, including the works of the great composers and musicians. · Learn to sing and to use their voices, to create and compose music on their own and with others, have the opportunity to learn a musical instrument, use technology appropriately and have the opportunity to progress to the next level of musical excellence. At Shakespeare Junior School, every child takes part in an hour of high quality Music lessons every week, with the opportunity to extend this through music lessons. We are fortunate to have access to a large music room which is sound proofed at Shakespeare Junior School. This music room has a range of instruments including xylophones, keyboards, drum kit and percussion. Year 3 have the opportunity to make their own instruments and play them in the summer term as well as performing in a production at Christmas time. Year 4 have the opportunity to be part of Listen 2 Me (one term per class). 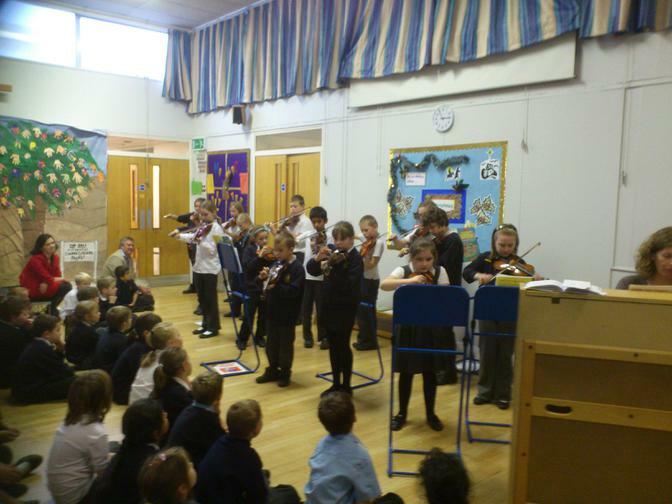 This is when an outside agency comes into our school, to teach a class a range of instruments which they then perform to parents. Some of the instruments have been ukuleles, guitars and violins. They really enjoy doing this as it gives everyone an equal opportunity to learn an instrument. 30 of the 90 children have also been chosen to learn songs which they will perform at Winchester Cathedral with 6 other schools. Year 5 get the opportunity to learn different songs which they will then all be going to the Anvil and performing with an orchestra and lots of different schools. This is a fantastic opportunity for them to share be part of a big choir. Year 6 get the experience of performing in a production at the end of the year. Over the years they have performed in different productions such as the Lion King and Aldan. We also offer private music lessons for a range of instruments including guitars, violins, drums and piano.